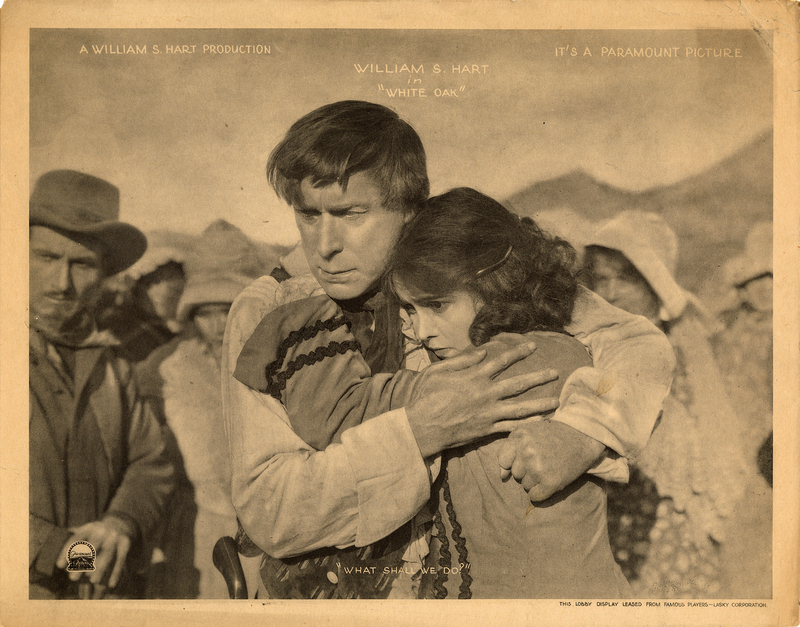 SCVHistory.com LW3283 | William S. Hart | Hart and Vola Vale Star in 'White Oak,' FPL-Paramount 1921. William S. Hart and Vola Vale star in "White Oak," produced by Hart in 1921 and distributed by Paramount Pictures, then a subsidiary of Adolph Zukor and Jesse Lasky's Famous Players-Lasky Corp. Lobby card promoting the original 1921 release (not a later re-release). "White Oak" would be Hart's sixth-to-last film. It premiered December 18, 1921, just months after the Federal Trade Commission started going after Zukor and Lasky for the monopolistic practice of block booking. Zukor and Lasky had realized back in the late Teens that they could cut out the middleman and reap all of the profits if they bought up distribution companies (such as Paramount and Artcraft) and theater chains. So they did. Famous Players-Lasky became the biggest theater owner in the world. To the independent movie theaters they didn't own, they said: "We'll only send you the new blockbusters that the audiences are demanding to see if you also rent the lousy pictures from us that nobody wants to watch." Or words to that effect. The independents had no choice but to book "blocks" of films. They couldn't just pick the one they wanted out of a catalog. The other major movie studios started doing the same thing, but Famous Players-Lasky was the big dog. It had the idea first. So in August 1921 the FTC sued Famous Players-Lasky and all of their relatives under the auspices of block booking being an unfair business practice. They all spent years in court until finally the FTC issued a cease-and-desist order in July 1927. In September 1927, Famous Players-Lasky reorganized and ultimately renamed itself Paramount Pictures Corp. Note the lobby card says, "This lobby display leased from Famous Players-Lasky Corporation." Lucky for us, the movie theater that rented the lobby card (and the film) didn't return it. Unlucky for us, most movie theaters didn't even return the films — which is a big part of the reason more than half of all silent movies are "lost." Not one single copy exists of more than 50 percent of all the silent movies ever made. "White Oak" exists. In fact, you can watch it here. This is a standard 11x14 sepiatone lobby card — standard for 1921, which tells us it accompanied the original release. It is not a later release. A later-release card would be in color. Up till about 1919, lobby cards were 8x10-inch black-and-white photographs. Then they switched to monochrome, 11x14 inches, usually sepiatone or blue. In 1921-1922 they were still 11x14, but they started to use four-color lithography. Few Hart films, no more than his last five, would have had four-color lobby cards on original release. There are other four-color Hart lobby cards, but they are from 1920s re-releases of Hart films made in (usually) the late 1910s. Hart, a contract player, got no money when a film was re-released in theaters. There were no residuals then, and not much in the way of profit sharing. Bill Hart would grow to despise them. Betrayed in love, betrayed by the studios, all he had left in the end was his fans. So he left them his property. LW3283: 9600 dpi jpeg from original lobby card purchased 2018 by Leon Worden.